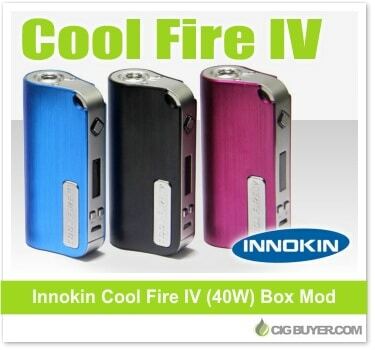 The latest in the “Cool Fire” series, the Innokin Cool Fire IV Mod is a great looking new box mod from Innokin that is both compact and powerful. With a aluminum and zinc alloy body, it’s lightweight, attractive and comfortable with a 2000mAh built-in battery and up to 40W of output. The Cool Fire 4 has a featured filled operating system with a variety of built-in protections, OLED display, VRMS power regulation, SS spring-loaded 510 connector and can fire down to 0.2 ohms.